Simply import it into a new CMSIS project. It compiled immediately with no error (which was encouraging). The example originally included a 2x16 LCD but I am not using it so I stripped the code to the bare minimum just to check the I2C. The problem is that the I2C hangs after sending the address. The clock line never goes back up. There is no device attached to the I2C port, just pull-up resistors and the scope. The code uses the standard libraries with no modification. // Wait for I2C EV5. // Wait for I2C EV8_2. Last edited by didier9 on Thu Jan 10, 2019 3:04 am, edited 1 time in total. It turns out the driver actually hangs until a slave acknowledges. I looked at the code more closely and indeed the i2c_address_direction() function call waits for an acknowledgment. I modified the function as shown below and now it properly exits with an error code if no slave acknowledges. It is pretty crude, I should use a timer but in a pinch it will work. 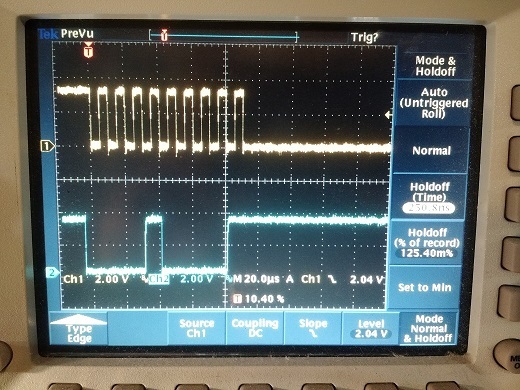 It is necessary because in my project, I use optional I2C peripherals so the processor must make a note of which I2C slaves are responding and not needlessly hang when one is not responding.